Posted in: St. Louis Cardinals. Tagged: Cardinals, Maikel Cleto, Major League Baseball, Memphis, Victor Marte. Between Victor Marte and Maikel Cleto, I’m tired of mediocre pitching. The organization still believes in them, but I left them behind well before spring training. Injuries have forced the Cardinals hand but can’t we do better than this? It’s torture watching these wild arms fail up on the mound. I’ve always been impatient with guys who just don’t seem to get it. 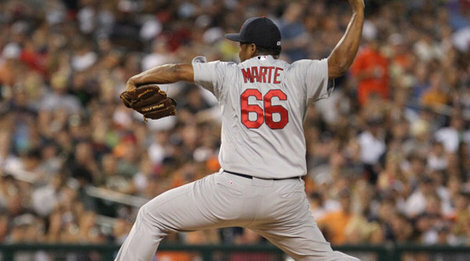 Victor Marte was closing in Memphis and seemed to be having some modest success. BUT he was still walking people at an annoying rate, as usual. Then he comes up and gives up bombs and hits batters. Really? In 83 MLB innings, Marte has an ERA of 7.05! I don’t even know what’s up with Maikel Cleto. He was starting in Memphis and had an ERA over 7 at one point. Yeah, he’s flashy with that 100 MPH fireball but HE CAN’T THROW STRIKES and when he does he leaves that straight beach ball right over the plate. In 15.2 MLB innings, Cleto has given up 18 ER with 7 HR. I just don’t get it. With all this herald pitching talent, the Cards shouldn’t have to rely on these guys.